If we are placing an implant into your upper jaw, a sinus lift (or sinus augmentation) may be required. This will be determined at the consultation appointment. A digital panoramic radiograph will be taken to evaluate the anatomy of your maxillary jaw and sinus areas. The procedure is performed under intravenous sedation or general anesthesia in Dr. Fatehi's surgery office. Therefore it is necessary for you to have a responsible driver and have had nothing to eat or drink for 6 hours prior to the surgery. The sinus lift procedure is a surgery that adds bone to your upper jaw. The bone is added by placing it into your sinus, an empty air chamber located on either side of your nose and above the roots of your premolars and molars. To make room for the bone, the sinus membrane has to be moved upward, or "lifted." The Lateral Window approach which is when an opening is made in the side wall of the sinus. An incision is made in the gum tissue near your premolars and molars. The tissue is raised, exposing the maxillary jaw bone. An oval window is created in the bone with a small bur until the sinus membrane is exposed. The membrane is then carefully detached from the walls and floor of the sinus with the use of various instruments. Granules of bone-graft material are then packed into the space of the floor of the sinus. The amount of bone used will vary, but usually several millimeters of bone is added to increase the vertical dimension. Once the bone is in place, a collagen membrane the size of the oval window is placed to cover the sinus opening. The tissue is then replaced and sutured. After the procedure, you will experience some swelling, and will have some bleeding from the incision site. Bruising can also be a post operative consequence of the surgery and the discoloration may extend from under the eye to, rarely, the neck area. Most of the swelling and bruising will subside around the 7th day. Since the nose and sinuses are connected, you may also notice a temporary nose bleed in the first 24 hours. You should avoid blowing your nose or sneezing while holding your nose shut for the first week, as these activities will cause increased sinus pressure and can cause the bone-graft material to herniate out of the sinus, leading to local irritation and infection. To relieve the temporary sinus symptoms, over the counter decongestants may be used on an as-needed basis. If you have seasonal allergies, you should schedule the procedure when they are not active. You also will be given pain medication and an antibiotic to help prevent infection. Most patients have only a little discomfort after a sinus-lift procedure. You will return to our office after 7 days for a post-operative evaluation and monitor your healing. Thereafter a few more routine checks will be scheduled to evaluate the healing process. When will the implant post be placed? 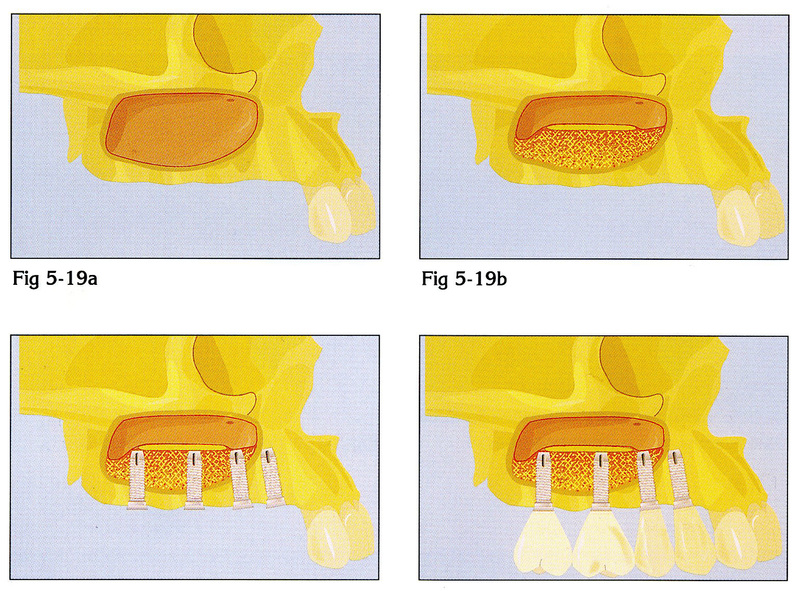 Your implant(s) will be placed six months after the sinus grafting. This time is needed to allow for the grafted material to solidify and provide adequate support for the implant(s).